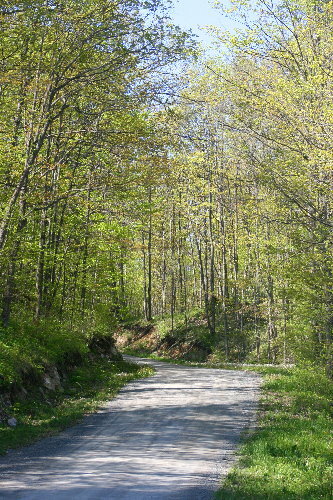 It’s amazing just how fast the trees leaf out once they start. Just two weeks ago I was noting the late afternoon sun glowing through the sprinkling of leaves on the saplings across the road from the house. Now, I can barely make out the neighbour’s house, which was so apparent in winter. By June, I won’t be able to see it at all. All manner of plant life has greened up or is hard at work at it. Some shrubs are completely leafed out, while the tall ash trees are only just starting. Like the creeks that start tumbling over their rocky beds at spring melt, once spring arrived, time seems to have picked up speed and is rushing by. We’ve had a fair bit of rain over the course of the last week. It seems to have gotten all the wet out of its system now, however, and we’re forecasted to have mostly clear skies the rest of the week (whether it remains that way remains to be seen). Although all that rain was undoubtedly part of the reason behind the green explosion, the animals were less than happy about it. 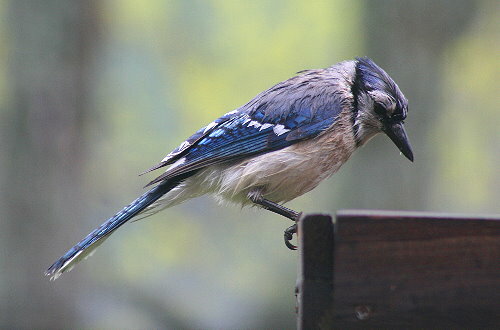 This Blue Jay, for instance, was looking a bit bedraggled as it visited the feeders one afternoon. The rain has made the ground near our dock rather soggy. As Dan was flipping his boat over one day last week to try to locate a leak that had gotten worse over the winter, he disturbed this guy from the pool of water around the boat. I spent a lot of time debating the identity of this guy. The bright green upper lip and speckled underbelly should make it easy to ID, I figured. 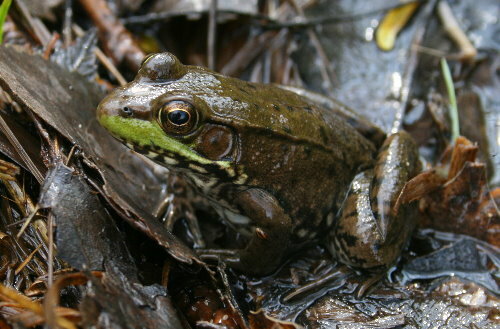 I think that it’s a Mink Frog, Rana septentrionalis, but it could also be a Green Frog, Rana clamitans. I couldn’t figure out a definitive ID characteristic that would rule one out based on the photos I have. A Mink Frog would be a “lifer” for me, a species that I’d never encountered previously. In Ontario they tend to be found further north than the GTA where I grew up, but we’d be at the southern edge of their range, here. They’ve been recorded over in the Park. I’m leaning toward Mink because of the small eardrums, dorsal ridges that terminate halfway down the back, and lack of strong barring on the back legs, but I get the impression these are all somewhat variable features. Before Dan flipped over his boat, he bailed out some of the water. And sitting in the water was this guy. 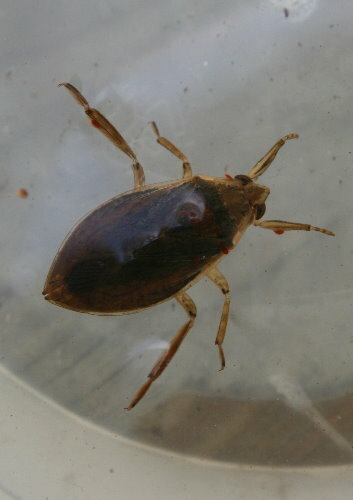 I believe it’s a water bug in the genus Belostoma. It was rather large, about an inch long, and quite active within the container Dan had scooped it into. This group of water bugs are among those where the female lays her eggs on the male’s back in the spring. He “broods” the eggs, keeping them clean of fungus, protecting them from predators, and making sure they’re well oxygenated (by doing “push-ups” at the surface of the water). I’m not sure if the lack of eggs on this one means it’s a female, or just a male that hasn’t been laid on yet. I did notice, however, in examining the photos on my computer, that it’s sporting a bunch of red mites. I found this strange beetle clinging to a piece of driftwood beside my moth trap one morning. I wasn’t sure if it was alive, as it fell off the wood when I touched it, and sat with its legs curled under it. I set it on a shelf in a vial for a couple of hours as I sorted through my trap and photographed the moths I’d caught. When I returned to it, it was sitting in a different spot in the vial, and its legs appeared to be out. As soon as I picked up the vial again, however, it fell over and its legs curled underneath it again. I pulled out my trusty Kaufman Guide to Insects (I love that book, have I mentioned that? ), and there it was at the bottom of page 193: Bolitotherus cornutus. 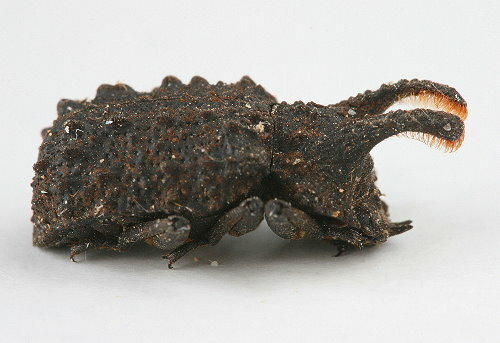 Looking it up on BugGuide.net reveals its common name to be Forked Fungus Beetle, or sometimes Horned Darkling Beetle. The two horns are projections from its thorax, and are used in “battle” with other males to win females (I’m not sure the purpose of the orange “hairs”). 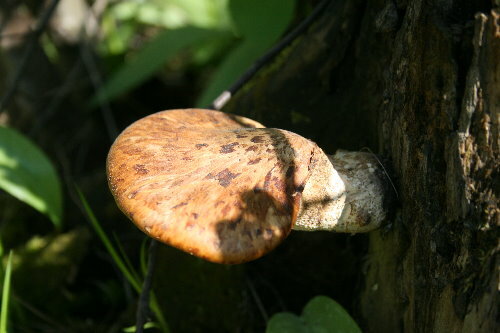 They are associated with bracket fungi of hardwoods such as maple and beech. The Kaufman guide makes a note that they are adept at “playing dead”, so I guess that’s what my beetle was doing whenever I disturbed it. Was pretty convincing! While out with Raven today I encountered this bracket fungus projecting from the side of a stump. Just recently I had read over at Huckleberry Days about Dryad’s Saddle, Polyporus squamosus, a stalked bracket fungus that appears about now, so I thought, “Aha! A Dryad’s Saddle!”. I took a documenting photo and returned home. I pulled out my mushroom guide just to confirm and look up a couple of life history details about the species, and now I’m not convinced that it’s Dryad’s Saddle after all. All the photos I can find on the web for the species show it being concave where it attaches to the stalk, rather than convex like my fungus. I searched through the guide a couple of times and poked about the ‘net, but couldn’t come up with an identity. 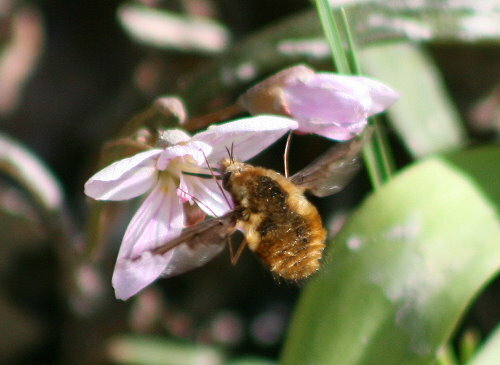 Very close to the same spot, I stood and watched this bee fly hovering at several Spring Beauties at the side of the road. It was much oranger than previous individuals I’ve seen, and I wondered if it was just a dark Bombylius major, the species I’ve seen before, or a different species. I gather the half-light/half-dark wing markings are fairly distinctive, and seem to only be shared by B. major and B. mexicanus. It’s hard to make out the specific pattern of dark, but I’m leaning toward B. major. I have no idea what this spider is. Not being insects, they’re not usually treated in much depth in the usual insect guides, although Stephen Marshall’s Insects doesn’t do too badly. 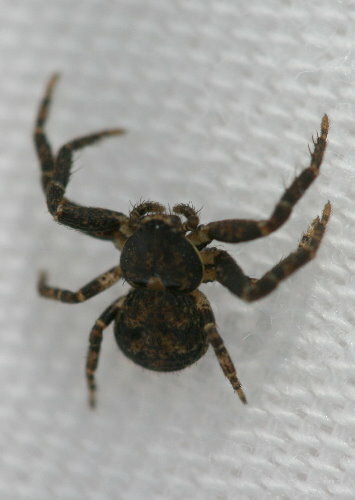 It looks like it might be a type of crab spider, but I’m not sure. I’d knocked it off the branch of a tree onto a white sheet when I was out looking for beetles (as per a post by Ted of Beetles in the Bush that suggested if you go around thwacking some branches in the spring, it’s possible to discover some beetles you might not normally encounter). I’ve only gone out the once and thwacked half a dozen branches before I was disrupted by the arrival of a real estate agent who was coming to take photos of the house, and then it rained much of last week. Now that the weather is nice again I plan to give it another try. 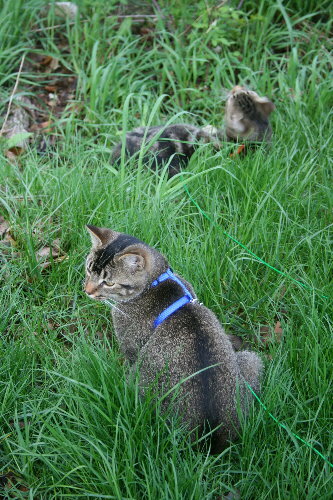 A few animals from a little closer to home… with the nicer spring weather the cats have been allowed to go outside in their harnesses to sit in the long grass, enjoy the sunshine, and watch the birds. They’re tied to the deck with short 10-foot leads, so they’re not really a threat to anything except perhaps the odd bug. Both for the safety of wildlife and the cats themselves, I never let my cats roam about outdoors, so this is about as outdoor-cat as these guys will get. They enjoy it, though. Despite the chipmunk who thumbs its nose at them by foraging on fallen seeds under the birdfeeder five feet away. 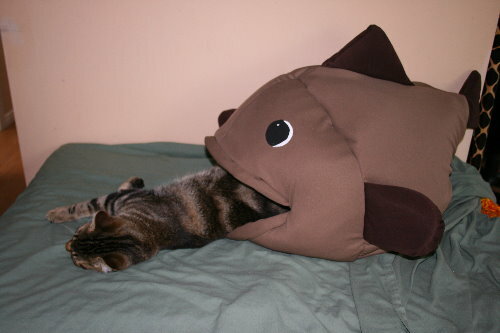 Fish eats cat. Fish spits up cat. Since late winter, when the snow was just starting to melt, Raven has been taking an increased interest in water. At the first start of ice breakup, she’d paddle her feet in the shallows of the lake, but it’s taken her a while of gradually working up to letting her feet leave the security of the ground. Even when she started doing that, she’d only push forward half a body length, and then quickly turn around to paddle back. After once or twice of that, she wouldn’t go after sticks that were further out anymore, she’d just look at you and whine. We’d taken her out in the boat a couple times and “thrown” her overboard, and she’d paddle back to shore just fine, but was reluctant to go in of her own accord. Then, a couple days ago, it was like she had an epiphany. We’d thrown a couple of sticks for her just out of reach from where her feet could touch bottom, and she’d pushed off to grab them, but turn quickly back around. She showed a bit of willingness to go a bit further, and so we got her to do two body lengths, and then three. Then Dan suggested throwing the stick way out and seeing if she’d go for it. So I tossed it four or five meters out, and she struck right out to retrieve it. Within the course of five minutes, she was suddenly paddling all over the place like a bonafide water dog. Not only that, but once she realized she wasn’t going to drown if her feet left the bottom, she discovered that hey – I actually like this! Now when we take her down to throw sticks for her, she’ll jump right in the water and start paddling out before you’ve even tossed the stick out. Quite a change from the puppy who was reluctant to even get her feet wet last fall! 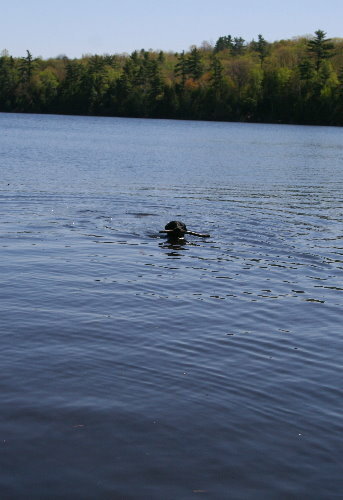 I”m pleased to hear that Raven has finally become the waterdog she was born to be! 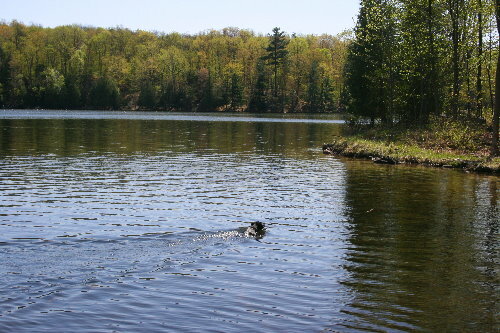 Throwing sticks for an enthusiastic dog and watching them throw themselves joyously into the water never gets old. Have fun! Love the “fish eats cat” photo! Good for Raven! As Barb said, watching the antics of a dog enjoying fetch and swimming rolled into one game is pretty much as fun as it gets. You have so many goodies in this post, but the beetle playing dead has to be my favorite (although “fish spits up cat” runs a close second! ).